Are you ready to learn about Gas Exchange and Transport? How about the Analysis and Monitoring of Gas Exchange? If so, then you’re in the right place. Because that is what this study guide is all about. 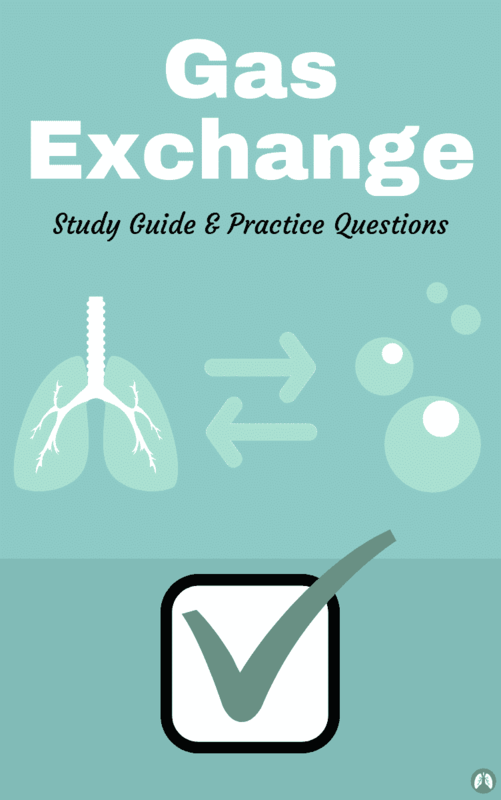 As I’m sure you’re already aware, Gas Exchange is a topic that you MUST know about as a Respiratory Therapy student. The good news — this study guide has practice questions that are designed to teach you all there is to know about the topic. This study guide correlates well with Egan’s Chapter 12 and Egan’s Chapter 19, so you can use this information to prepare for your exams. So if you’re ready, let’s go ahead and dive right in! If your Respiratory Therapy program is like mine, then you probably use the Egan’s Workbook. It’s a solid workbook that can be helpful at times. The problem is, it takes way too long to look up all the answers. This is problematic for busy RT students as yourself. 1. What are the two forms in which oxygen is transported? Physically dissolved in plasma and chemically bound to hemoglobin. 2. What are the additional costs of increased ventilation? Increased work of breathing, increased oxygen consumption, and a higher burden of external ventilation. 3. What is the alveolar air equation (based on Dalton’s law)? 4. What must exist in order for gas exchange to occur between the alveoli and pulmonary capillaries? A difference in partial pressures. 5. What is an area with ventilation but no blood flow called? 6. What is the formula for figuring out how much oxygen is dissolved in the plasma? Henry’s Law, which states: Dissolved oxygen (ml/dl) = PO2 x 0.003. 7. The oxyhemoglobin dissociation curve describes what? The relationship between PAO2 and SaO2. 8. Hemoglobin Saturation is defined as what? Saturation is the % of Hb that is carrying oxygen compared to total Hb. 9. How many oxygen receptors does Hemoglobin have? 10. How much oxygen is bound to hemoglobin? 1.34 mL of oxygen per gram of hemoglobin. 11. What is the normal CO2 pressure in the vein? 12. What is the normal oxygen pressure in vein? The process of moving oxygen to tissues for aerobic metabolism and removal of CO2. 14. What is the Right-Left Shunt? Malfunction in the septum that causes deoxygenated blood to travel from the RIGHT atrium to LEFT atrium. 15. What is the total O2 content of blood equation? CaO2=(0.003 x PaO2) + (Hb x 1.34 x SaO2). 16. What are the disorders that lead to alveolar deadspace? Pulmonary emboli, partial obstruction of the pulmonary vasculature, destroyed pulmonary vasculature, and reduced cardiac output. 17. What causes relative shunts? COPD, restrictive disorders, and any condition resulting in hypoventilation. When hemoglobin binds to carbon monoxide, it has a 200x greater affinity than oxygen. It results in the bound oxygen not being able to unload. This causes a left shift in the HbO2 curve. 19. What is deadspace ventilation? When there is ventilation in excess of perfusion. Ferric iron that cannot bind with oxygen and alters the HbO2 affinity. It causes a left shift in the HbO2 curve. 21. What is needed for CaO2 to be adequate? Sufficient normal Hemoglobin. If hemoglobin is absolute low, will result in anemia. 22. What is P50 in regards to the HbO2 Dissociation curve? It shows what the PO2 is when the hemoglobin is 50% saturated with oxygen. 23. What is reduction in blood flow called? 24. What is sickle cell? Abnormal hemoglobin that is fragile that leads to hemolysis (H2O goes in until cell ruptures) and thrombi. 25. What is the best value to assess ventilation? 26. What is the formula for alveolar minute ventilation? 27. What is the importance of the Bohr effect on Oxygen Transport? pH has an effect of Hemoglobin’s affinity for oxygen. A low pH shifts the HbO2 curve to the RIGHT and a HIGH pH shifts the curve to the left. 28. What is the majority of the oxygen in the body carried in? It is bound to Hemoglobin. 29. What is the normal Methemoglobin % reading? 1% – 2% on a Co-Oximeter. 30. What leads to an increased PaCO2? Decreased VA, increased VCO2, and increased VD. The process of getting oxygen into the body for tissue utilization and the removal of CO2 into the atmosphere. 32. Oxygen must be moved into the lungs where? Where it diffuses into the pulmonary circulation and is transported into the blood to the tissues. 33. Carbon dioxide builds up into the tissues because of what? 34. Carbon dioxide diffuses into what? Capillary blood before being carried to the lung for exchange with alveolar gases. 35. Gas movement between the lungs and tissues occurs by what? 36. What is the final gradient for oxygen infusion into the cell? Intracellular PO2 (5 mm Hg). 37. What is the diffusion gradient for carbon dioxide? Highest in the cells 60 mm Hg and lowest to room air 1 mm Hg. 38. What is the difference of the oxygen diffusion gradient compared to the carbon dioxide diffusion gradient? Oxygen has a cascade gradient moving from the atmosphere to intracellular. Carbon dioxide moves from intracellular to the atmosphere. 39. The carbon dioxide diffusion gradients cascade causes what? It causes CO2 to move from tissues into the venous blood, which is transported to the lungs and out to the atmosphere. 40. The alveolar partial pressure of carbon dioxide (PACO2) varies directly with the body’s what? It varies with the body’s production of CO2 and inversely with alveolar ventilation. 41. What factor is used to convert VCO2 from STPD to BTPS? 42. Normally complex respiratory control mechanisms maintain the PACO2 within a range of what? 43. If carbon dioxide production increases as with exercise or fever, what happens to ventilation? Ventilation automatically increases to maintain PACO2 within the normal range. 44. What is the most important factor in determining the alveolar partial pressure of oxygen (PAO2)? Inspired partial pressure of oxygen (PIO2). 45. Once oxygen is in the lungs it is diluted by what 2 things? Water vapor and carbon dioxide. 46. What is the alveolar air equation formula? 47. According to Dalton’s law, the partial pressure of alveolar nitrogen must be what? It must be equal to the pressure it would exert if it alone were present. 48. Based on the alveolar air equation, if the FIO2 remains constant, the PAO2 will? It will vary inversely with PACO2. 49. When a patient is breathing room air what is the sum of the alveolar PO2 and alveolar PCO2? 50. If a patient is breathing room air at sea level, the respiratory therapist should or shouldn’t expect to see a PaO2 any higher that 120 mm Hg during hyperventilation? They should not expect any higher than 120 mm Hg. 51. PO2 values higher than 120 mm Hg indicate what? The patient is breathing supplemental oxygen. The process of gas molecules moving from an area of high partial pressure to low partial pressure. 53. In order for oxygen to diffuse into and out of the lung and tissues, oxygen and carbon dioxide must move through what? 54. What 3 barriers must be penetrated in order for oxygen and CO2 to move between the alveoli and pulmonary capillary blood? Alveolar epithelium, interstitial space, and capillary endothelium. 55. What is Fick’s first law of diffusion? The greater the surface area, diffusion constant, and pressure gradient, the more diffusion will occur. 56. Diffusion in the normal lung mainly depends on what? 57. The pressure gradient for oxygen diffusion into the blood is approximately? 58. Does carbon dioxide diffuse faster or slower across the alveolar-capillary membrane than oxygen? It diffuses 20 times faster because of its much higher solubility in the plasma. 59. The diffusion time in the lungs depends on what? The rate of pulmonary blood flow. 60. How long does blood take to flow through the pulmonary capillary? 61. Low concentrations of what are used more commonly to measure diffusing capacity of the lung? 62. The PaO2 of healthy person breathing at sea level is approximately how much less than the calculated PaO2? 63. What are the 2 factors that account for the 5-10 mm Hg difference in calculated PaO2? (1) Right to left shunts in pulmonary and cardiac circulation, and (2) Regional differences in pulmonary ventilation and blood flow. 64. What does a right to left shunt cause poorly oxygenated venous blood to do? It causes it to move directly into the arterial circulation, lowering the oxygen content of the arterial blood. 65. What is the ideal ventilation and perfusion ratio? 66. A high ventilation/perfusion ratio indicates that? Ventilation is greater than normal, perfusion is less than normal, or both. 67. Regional differences in V/Q ratios in the normal lung are caused by? Gravity and most evident in the upright position. 68. Does perfusion increase or decrease farther down the lung? It increases. The bases receive nearly 20 times as much blood flow than the apexes. 69. Does ventilation increase or decrease farther down in the lung bases? It increases. There is four times as much ventilation in the bases than in the apexes. 70. Blood carries oxygen in what 2 forms? (1) Dissolved in plasma and erythrocyte fluid. (2) The majority is carried in combination with hemoglobin inside the RBC. 71. What is the formula for dissolved oxygen in blood? 72. Deoxygenated hemoglobin serves as a what in transport? An important blood buffer for hydrogen ions; important in carbon dioxide transport. Oxygen molecules bind to hemoglobin by way of ferrous iron ion and is converted to it’s oxygenated state. 74. In whole blood, each gram of normal hemoglobin can carry how many mL of oxygen? 75. Hemoglobin increases the oxygen carrying capacity of the blood by how much? 70 fold as compared to plasma alone. The measure of proportion of available hemoglobin that is actually carrying oxygen. 77. According to Fick’s equation, if the oxygen consumption remains constant, a decrease in cardiac output will do what to the arteriovenous oxygen content difference? It will increase the C(a-v)O2. 78. According to Fick’s equation, if the cardiac output rises and oxygen consumption remains constant, what will happen to the arteriovenous oxygen content difference? 79. What are some factors other than the HbO2 curve that affect oxygen unloading and loading? Blood pH, body temp, erythrocyte concentration of certain organic phosphates, variations in the structure of Hb, chemical combinations of Hb with substances other than oxygen. 80. A low pH shifts the curve to the? 81. A high pH shifts the curve to the? 82. When blood pH drops and shifts the curve to the right, the hemoglobin saturation for a given PO2 will do what? 83. As blood pH rises and the curve shifts to the left, hemoglobin saturation for a given PO2 does what? 84. As blood in the tissue picks up CO2, pH falls and the HbO2 curve shifts which way? It shifts to the right, therefore, decreasing the affinity of hemoglobin for oxygen. 85. A drop in body temperature shifts the HbO2 curve which way? It shifts the curve to the left, increasing the hemoglobin affinity for oxygen. 86. As body temperature rises, the curve shifts which way? It shifts to the right and the affinity of hemoglobin for oxygen decreases. 87. What happens to DPG in banked blood? It decreases in concentration over time and after a week of storage there is less than 1/3 of the normal value of DPG. This shifts the HbO2 curve to the left decreasing availability of oxygen to the tissues. 88. What color is the blood of a patient who has methemoglobin? 89. Hemoglobin’s affinity for carbon monoxide is how much greater than it is for oxygen? 90. The combination of carbon monoxide shifts the HbO2 curve which way? It shift it to the left, impeding oxygen delivery to the tissues. 91. What is the treatment for carbon monoxide poisoning? Giving the patient as much oxygen as possible because oxygen reduces the half-life of carboxyhemoglobin. Sometimes a hyperbaric chamber is used. 92. What is a normal P50? 93. Conditions that cause an decrease in hemoglobin affinity for oxygen cause a shift which way? 94. How much carbon dioxide is carried in the blood? 95. In what three forms is carbon dioxide carried in the blood? (1) Dissolved in physical solution, (2) chemically combined with protein, and (3) ionized as bicarbonate. The chemical process in which a molecule is cleaved into two parts by the addition of a molecule of water. 97. What does the hydrolysis of CO2 form? 98. What enzyme enhances the hydrolysis reaction? 99. In what three ways will hypoxia occur? If the arterial blood oxygen content is decreased, if cardiac output or perfusion is decreased, or if abnormal cellular function prevents proper uptake of oxygen. 100. When does hypoxemia occur? When the partial pressure of oxygen in the arterial blood (PaO2) is decreased to lower than normal. 101. What things might a decreased PaO2 be caused by? Low ambient PO2, hypoventilation, impaired diffusion, V/Q imbalances, right to left anatomical or physiological shunting, aging, altitude. 102. What is the approximate PaO2 at the age of 60? 103. What is the most common cause of hypoxemia in patients with lung disease? 104. What happens when ventilation is greater than perfusion? There is wasted ventilation — alveolar dead space. 105. What happens when ventilation is less than perfusion? The ventilation perfusion ratio is low and blood leaves the lungs with abnormally low oxygen content. 106. What does a ventilation perfusion imbalance of 0 represent? There is blood flow but no ventilation and is equivalent to a right to left anatomical shunt. 107. To differentiate between hypoxemia caused by a V/Q imbalance and hypoxemia caused by shunting, what do you do? If the oxygen is more than 50% and the PaO2 is less than 50%, significant shunting is present. Otherwise, it is a V/Q imbalance. 108. For the arterial oxygen content to be adequate, there must also be? There must be enough normal hemoglobin in the blood. 109. Can hypoxia occur if the hemoglobin is low even when the PaO2 is normal? Yes it can, because of low oxygen content in the arterial blood. 110. What can a low hemoglobin content do to the oxygen carrying capacity of the blood? It can seriously impair the oxygen carrying capacity of the blood. 111. What are the 2 types of reduced blood flow? Circulatory failure (shock), and local reduction in perfusion (ischemia). 112. What leads to lactic acid accumulation and metabolic acidosis? Tissue extraction reaches a maximum and decreases the delivery of oxygen, resulting in an oxygen debt due to the oxygen demand exceeding oxygen delivery. 113. In sepsis and ARDS, oxygen debt may occur at normal levels of? 114. Any disorder that lowers alveolar ventilation relative to metabolic need impairs what? 115. What does impaired CO2 removal by the lungs cause? 116. When does a decrease in alveolar ventilation occur? When the minute ventilation is inadequate, dead space ventilation per minute increases, or a ventilation perfusion imbalance exists. 117. Inadequate minute ventilation is caused by? 118. Inadequate minute ventilation occurs in what types of conditions? Restrictive conditions: atelectasis, neuromuscular disorders, or conditions that impede thoracic expansion (kyphoscoliosis). 119. An increased dead space ventilation is caused by either? Rapid shallow breathing, or increased physiologic dead space. 120. What does increased dead space ventilation cause? The proportion of wasted deadspace increases and lowers alveolar ventilation and impairs CO2 removal. 121. In theory, V/Q imbalance should cause a rise in PACO2. However, many patients who are hypoxemic because of a V/Q imbalance have a low or normal PaCO2. What does this suggest? V/Q imbalances have a greater effect on oxygenation than on carbon dioxide removal. 122. To compensate for high PCO2 values with V/Q imbalances, what must happen? The patient’s minute ventilation must increase. 123. When a patient is hypercapnic, what must happen for them to maintain a normal PaCO2? They must sustain a higher than normal minute ventilation. 124. What are the disorders leading to alveolar deadspace? Pulmonary edema, Partial obstruction of the pulmonary vasculature, Destroyed pulmonary vasculature, Reduced cardiac output. 125. Gas moves across the system by what? 126. How long is pulmonary blood exposed to alveolar gas? 127. How long is pulmonary blood exposed to alveolar gas during exercise? 128. How many times greater is ventilation at the bases? 129. How many times higher is blood flow at the bases? 130. In what two forms are oxygen transported? Dissolved in blood and Bounded by Hemoglobin. 131. The portion of inspired air that is exhaled without being exposed to perfused alveoli is what? 132. A pressure gradient must exist for gas to move between what? The alveolus and pulmonary capillary. 133. Assuming a constant FIO2 and carbon dioxide production, alveolar ventilation increases, PACO2 decreases and what happens to the PAO2? 134. What is ventilation that doesn’t participate in gas exchange? 135. What is ventilation that enters into alveoli without any perfusion? 136. Why is it problematic for ventilation that never reaches the alveoli for gas exchange? It becomes problematic in conditions where tidal volumes drop significantly. Significant % of inspired gas remains in anatomic deadspace. 137. What are the barriers to Gas diffusion? Alveolar epithelium, Interstitial space and structures, capillary endothelium and RBC membrane. 138. What are the transport mechanisms for Carbon Dioxide? Dissolved in blood, Combined with Protein, and Ionized as HCO. 139. What are the values for normal partial pressure of arterial blood? O2 = 100 mmHG, CO2 = 40 mmHG. 140. What are the values for normal partial pressure of venous blood? O2 = 40 mmHG, CO2 = 46 mmHG. 141. What happens to CO2 and PaO2 levels if you increase deadspace? CO2 increases and PaO2 decreases. 142. What is the approximate normal level of carbon dioxide production for an adult? 143. What is the normal range for SaO2? 144. What is the portion of cardiac output that returns to left heart without being oxygenated by exposure to ventilated alveoli? 145. What ratio represents the perfect V/Q balance? 146. Where does CO2 move from and to? It moves from intracellular to the atmosphere via expiration. 147. Where does oxygen move from and to? It moves from being inhaled from the atmosphere to intracellular. 148. Which transport route transports more oxygen? Hemoglobin transports 70 times more oxygen than the blood. 149. What is the most common approach to analyzing gas exchange between the blood and tissues? Measure oxygen levels in the mixed venous (pulmonary artery) blood. 150. How do we analyze gas exchange between the lungs and blood? Oxygen and CO2 levels in ARTERIAL blood. CO2 levels in expired air. 151. How do we analyze gas exchange levels between blood and tissue? Oxygen levels in mixed venous (pulmonary artery) blood. 152. In high altitudes, what inaccuracy will the oxygen analyzer read? A lower % than actual. 153. Our clinical focus is on gas exchange between what? 154. What are the 2 most important factors influencing accuracy of transcutaneous measurements? 155. What does capnometry measure? CO2 in respiratory gasses. A capnometer functions on basis that CO2 absorbs infrared light proportion to amount of CO2 present. 156. What does oximetry measure? So there you have it. That wraps up our study guide on Gas Exchange and Transport. I hope that this information was helpful. If you do not feel comfortable with this information yet — that’s okay! Just be sure to go through these practice questions until it sticks. Thank you so much for reading and as always, breathe easy my friend.